DESCRIPTION: Schism was a Post Punk Prog band from Melbourne, Australia that later evolved into a Synth Pop band. It included in the band Music Industrapedia founder and creator Simon Rashleigh (AKA Simon Circus) on Lead Vocals and Synth Effects and notable Australian film music composer Christopher Gordon on Keyboards. Schism (1981 - 1983) were a Post Punk Prog band from Melbourne, Australia that evolved into an Synthpop band (with some post-punk prog elements remaining) in the second stage of their existence. 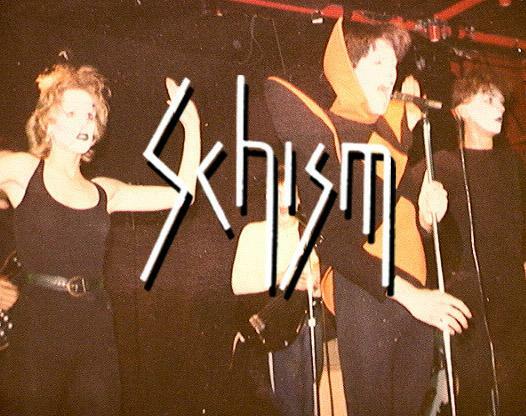 Schism were keyboard dominated, and highly theatrical and used to be a part of Melbourne's underground music scene of the early 1980's. The band had three definite eras in its existence which was represented either as the comings and goings of band personnel (early to mid Schism) and a significant genre change (late Schism). Its two earlier incarnation periods included the use of what Schism called their 'Shadow Characters' who were one male (Dayvideo) and one female (Vera / Debbie) dressed in full black body stockings and 'match-mimed' the strange stage movements and antics of frontman Simon Circus giving him a yin/yang like double shadow effect of a male and female shadow diagonally behind him on either side, which matched with the use of props, lights, strobes, smoke, mirrors and lasers produced a visually rich stage show. The sound of early Schism has been described by some as like a new romantic / gothic version of King Crimson meets The Tubes combined with other elements of Magazine, Bauhaus, Gong and early Split Enz and ENO thrown into the mix. In some ways early Schism were a fish out of water in Melbourne in the early 80's due to them being either a bit too progish (prog being a dead genre at that time in Australia) and for not being post-punk enough (ala the 'Birthday Party'). In addition to that they were also considered to be not 'Pub Rock' enough (ala The Angels) - (which they were never going to be), despite suggestions by some promoters as being their only option to get gigs. As a result of these perceptions, Schism caved in and went through an identity shift and tried to fit in more with the market at the time to try appeal to the 'professional taste-makers' of that era. Despite the challenges of having the 'powers that be' in the Australian music industry not knowing what to do with early to mid Schism, they still enjoyed sharing the stage with other prominent indie up and coming bands of the time such as The Birthday Party, Dead Can Dance, INXS, Hunters and Collectors and Beargarden as well as headlining in their own shows. This rethink of their sound and style then brought on their later and final stage of development where they embraced the (yet to be named) genre of the synthpop (originally called electro-pop) movement that was sweeping the pop/rock market of Australia at the time and shifted their direction to embrace synthpop including the "post new romantic" use of slick looking lounge suits (with a nod to Ultravox, Spandau Ballet and ABC in both sound and looks). Late Schism also recruited British expat David Lord to be their manager. As late Schism, they recorded (C'est Ca Studios - Fitzroy) and released a self titled cassette album which had some promising indie retail sales in Australia and Germany and they were booked as a live act by both Premier Artists and Nucleus Agencies (who were testing the waters with Schism, but not ready to sign them). Late Schism often supported bands such as Real Life, Pseudo Echo and Kids In The Kitchen with their synthpop sound (RL/Pseud Ech) or similar audience appeal (KitK). Schism were also performing in their own headline gigs around town in addition to these supports. Although Schism's new style was a definite departure from their earlier style, they brought a quirky element to synthpop from their early post punk prog stylings including the continued use of theatrical lighting (thanks to their lighting maestro Tom Orchard) and dramatic stage presence by their lead singer Simon Circus. Schism started to receive some record company interest and received some prominent support spots, but internally the personalities of the band started to unwind. Schism split in 1983, due to musical differences between their major song writer and main keyboardist (of late Schism) Scott Griffiths and the rest of the remaining band (Simon Circus, Dayvideo and Gordon Graham). The three remaining members decided to form a new band out of the ashes of Schism called illustration which operated from 1983 to 1984 and which had a more electronic sound akin to Depeche Mode compared to the very 'Ultravox' like sound of late Schism. Please contribute any writings or images to this page if you have more information or history to share with the Music Industrapedia Community on SCHISM (The Band). Please visit our Contributions page for details. Also, please feel free to discuss the development of this page by clicking on the "DISCUSS" link at the bottom right hand side of this page.